Tai in Chinese means “bigger than big.” Chi is not actually the correct word. The correct word should be ji. Ji means extreme. The correct combination for Tai Chi in Chinese is tai ji chuan. Chuan is “boxing” or “fist”. Altogether, it means grand force boxing, and Tai Chi certainly has its martial aspect. 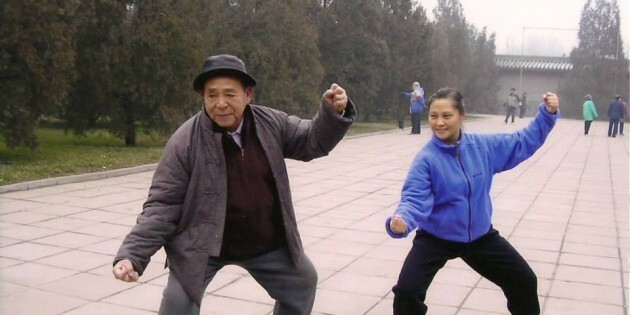 In the United States, most people just say Tai Chi and skip the chuan. It is easier to say, and most of us use it for health anyway, not for fighting. Tai Chi is an art, a beautiful art of motion. Performing Tai Chi is like dancing in the clouds. That is why it intrigues people from all over the world. Lovely to watch, it has entertainment value as it is presented internally and externally. This is why you get pleasure from your self as well as from others doing it. I call this kind of pleasure a natural tranquilizer. Unlike other tranquilizers, Tai Chi is no depressant. Even when things cause people to be depressed, they can quickly use Tai Chi to activate and redirect the energy, eliminating the depressed mood. Tai Chi is also a form of meditation, sometimes called walking meditation or moving meditation. This kind of meditation helps you to focus on the present moment, on your own energy center. You can simply detach yourself from old, disturbing memories. It helps you to relieve stress, untangle your troubled life, and get rid of much of the junk that might be interfering with your happiness. Tai Chi is an energy workout that builds your strength both internally and externally. Qi Gong is also thought of as an energy workout, and Tai Chi is considered its highest level. These kinds of energy practice can improve energy and blood flow in your body, enhance your immune function, and improve your daily energy level and mental sharpness. Tai Chi is a training of discipline and focus. This type of training and discipline can help you to improve many things that happen in your life. It can also help you to reach your future goals once you develop this discipline. Tai Chi is a martial art, derived from the whole body of martial arts. In every movement of Tai chi, you can find a martial application that can be used for self-defense. As your practice proceeds to higher levels and you continue to study Tai Chi in-depth, you will notice this more and develop these self-defense skills. Tai Chi is preventive medicine — energy medicine or natural healing medicine, because it enhances your self-healing ability, balances your energy, and prevents disease. For people who have chronic ailments where conventional medicine offers no relief, Tai Chi can assist healing. For people who have cancer, Tai Chi is an excellent natural medicine that enhances the immune system. Tai Chi is also a social medicine. Since it reaches us to focus on ourselves and strengthen our own energy, it prevents violence and other social problems.